Bell-Carter Medium Pitted Ripe Olives 6 oz. Ripe Olive Pitted Jumbo Black - 49 Oz. Sliced California Black Ripe Olives - 2.25 Oz. Olive Stuffed - 5.75 Oz. 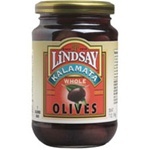 Olives Black Pitted Ripe Large - 6 Oz. Olive Sliced Tray Domestic - 6.5 Oz. Ripe Olives Sliced Pouch Black Domestic - 33 Oz. 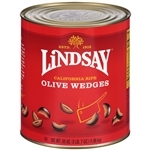 Lindsay Naturals Sliced Olives - 55 Oz. The best restaurant olives in the world. Olives are a fruit that grows on trees that can live hundreds of years. They are very bitter and must be cured to reduce this bitterness. The curing process takes weeks to months. Bell Carter Olives have antioxidant and anti-inflammatory nutrients which help to prevent cancer. Olives also have great cardiovascular properties for your blood system. Make sure your restaurant patrons get plenty of olives in their meals at your restaurant. This gave Arthur the opportunity to expand his sales efforts, and by 1940 they had become a powerful force in the national olive market. During the next two decades, the Bell brand focused its efforts on grocery stores, delicatessens and supermarkets, while Bell-Carter diversified its product line to appeal to consumers and restaurants. Then in 1964, the third generation of the family entered the business, with the addition of Daniel's sons, Tim and Jud Carter. In the 1990’s, the company tripled sales through acquisitions and diversification. This expansion included the purchases of The Maywood Olive Company, Oberti Olive Company and the Lindsay Olive Company. Today, we sell and market domestic olives, imported olives, and olive-related specialty products under the Lindsay and Bell brand names. Bell-Carter Foods, Inc. is the largest table olive producer in the U.S. and the second largest in the world. We produce and sell well over half of all California olives in the nation, providing full-time employment to more than 500 people. Year after year, our commitment to quality has been rewarded with high ratings in the industry. No other olive company in the world has comparable ratings.